I launched my first Kickstarter Project last week. I’ve raised money before- to put on concerts, to fund a cultural exchange, to start a business. But this is different. It’s more personal. I knew that Kickstarter was a powerful tool to engage with one’s community. I even expected to learn some things–about marketing, and the art of persuasion. What I didn’t expect was that this would turn out to be one of those life experiences in which the benefit winds up being as much or more in the process as in the result. Don’t get me wrong. I want my project to fund. I’m going to work to that end. But I can also see that this experience has the potential to change me-maybe even profoundly. I know it has just been a little over a week, but here are some of the lessons I’ve learned from Kickstarter. 1. Kickstarter says it is ok to ask for help. The first thing one has to do to launch a Kickstarter project is to find a way to say clearly, graciously and articulately: “Help Me!” Kickstarter requires that I practice humility, that I set aside the facade of self-sufficiency – my customary “I can handle it on my own” posture – and announce for the entire world to see that I need other people. Yes, I imagine some would say that you could use hype. That you sell your project on how exciting your rewards are, and how cool people will feel to be associated with you. But I have looked at several projects on Kickstarter, and that is not what I see. I see people saying honestly, humbly. “Hey. I really want to do this thing and I need your help. If promoting that model were the only good that came out of Kickstarter, it would still be a very powerful thing. 2. Kickstarter asks that I consider that I am enough. No raffles, no contests, no cash prizes, no free airline tickets, just things you make or provide yourself. As artists, we are not accustomed to thinking that we are enough. That our creativity, our imaginations, our quirkiness, our ideas, our real selves is what people really want-not the bells and whistles. Kickstarter suggests that I re-examine what it is I actually have to offer. 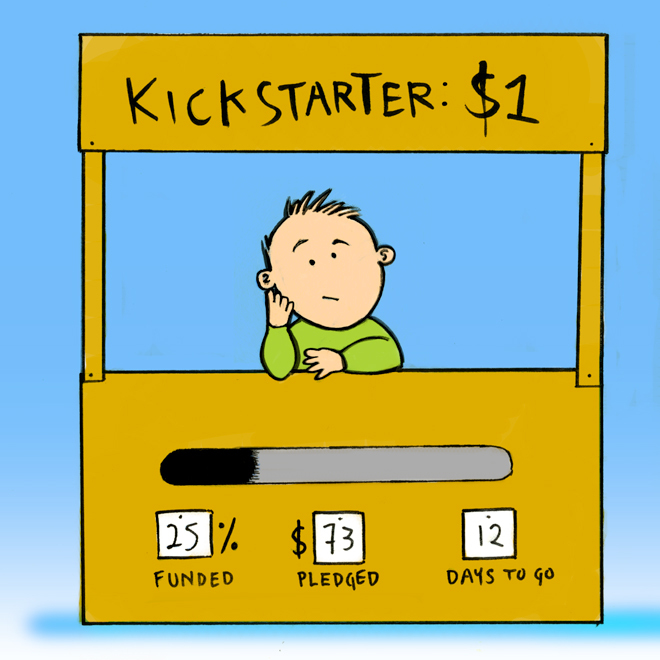 The most common “reward” on Kickstarter is…gratitude. And it isn’t expensive. Even one dollar will get you a heartfelt thank you. And then there is the art given away in every variety one can imagine: samples of the art, previews of the art, details about the art, an inside look at the art, outtakes of the art, rehearsals for the art, and the most valuable premiums: a personal connection with… the artist. That’s it. And time after time, this is what seems to get projects funded. Could it be that this is what people really want? My gratitude? My Art? A connection? Kickstarter requires that I explore that possibility. 3. It doesn’t take much. Six hours after I launched my Kickstarter, I had my first dollar- from someone I didn’t know. Maybe I’ll feel differently on future projects, but I have to say that first dollar gave me jolt like an electric charge. Maybe this thing might actually work. That dollar gave me a lesson in effective philanthropy and a strategy for empowering people that I’ll never forget. Every dollar does count. It doesn’t take much- to give hope, to get someone started, to say, “Carry on,” and to start the ball rolling. 4. Kickstarter is all about faith. Faith in the generosity of other people. Kickstarter’s genius was to create a conduit for people’s generosity. Every tick of that backer meter is an indication of the willingness of the people around me to give. People I know and people I’ve never met. I don’t believe one can experience that generosity and not be changed a little bit. Can not have just a bit have more faith in the incremental. I don’t know how this project will play out. Maybe I’ll get the big gift, the superhero save that will lift me to my goal in one fell swoop. I certainly daydream about that. Maybe someone will be moved to give a major gift of $500 or $1K. But while I’m waiting for that, the days tick by, and the house is getting built brick by $5, $25, $50 or $100 brick And that is the lesson I really need to learn- to have faith -not in superman or Santa Claus but in the possibility of many human-sized hands getting the job done. “Crowd-funding” is really just fancy way to say that many people working together doing small things can make something happen. I don’t know about you, but I forget this all the time. I think: I’m not Bill Gates or Phil Knight or Warren Buffett –somebody who can make a real “dent in the world” as Steve Jobs used to say. But Kickstarter begs to differ. If I’m willing to be patient. If I’m willing to ask for help. If I’m willing to believe that people care. If I can understand that I don’t have to solve the whole problem, just lend a helping hand, then dents will occur. Many little dents, adding up to something. It only took a week for Kickstarter to teach me all these things- which I realize that so many people already know. Whether my project funds or not (I’m choosing to believe it will), I have a chance to be a better person for taking this leap, more hopeful, more optimistic and more willing to risk giving it away.